Bernard and Henry Schanzer are alive because — despite the evil all around them during the Holocaust — good people risked their own lives to ensure their survival. The 81-year-old identical twins, their mother, and their sister were hidden in France during the war, later emigrating to the United States. Bernard, who lives in West Orange, became a neurologist, and Henry, of Edison, became a patent lawyer; their sister, Anna, lives in Israel. On Aug. 9 at Torah Links of Middlesex County in East Brunswick, the brothers recounted their saga of survival before a gathering of some 50 community members. 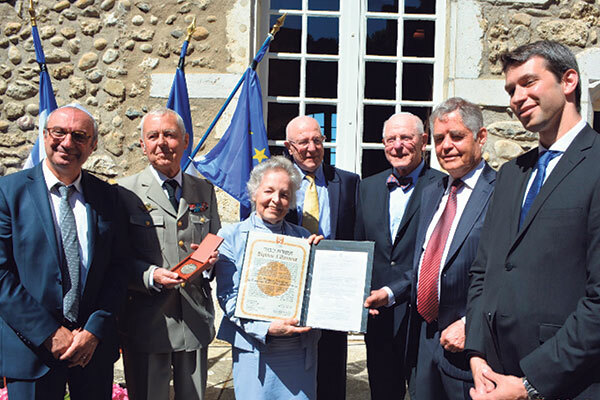 They also talked about their July trip to France, where their rescuers were honored by Yad Vashem in a ceremony that included their descendants and drew hundreds of local residents and officials. The twins’ parents, Czech-born Bruno and Polish native Bella, met and married in Belgium before the war. After the Germans invaded Belgium, they fled to the town of St. Etienne in France in 1940. They never saw Bruno again; they believe he died in Auschwitz. When returning home after a visit to her sons, their mother learned there had been a roundup of Jews, including her husband, all of whom were later murdered. While wandering with no place to go in St. Etienne, Bella ran into Jeanne Bonhomme, a dressmaker whose services she had previously used. Bonhomme obtained false identification papers for Bella at great risk since the French official she went to and the person who prepared the documents could have told the authorities or been killed themselves if they were found out. Bonhomme also arranged for the renamed “Marie Laebitier” to work in a castle owned by Count Xavier and Countess Marie-Francoise de Virieu, who were with the French Resistance. They also took in the twins’ sister and a cousin. The farmer who was sheltering the brothers became increasingly nervous about hiding Jews, and left them at a local police station. They were then sent to a Catholic orphanage, said Bernard, and later a farm and then a boarding school. Bonhomme finally arranged for them to live with her mother, Adolphine Dorel, on her farm in St. Pal de Mons, where they formed “a strong bond” with the woman they called “La Meme,” or grandma. Dorel told everyone they were her grandchildren and treated the boys as if they were. “We have wonderful stories about La Meme,” said Bernard, as they recalled the kindness and love she showed them. When Count de Virieu learned he had been denounced and the police were coming for the Jews in his care, he arranged for Bonhomme to take them to a nearby farm until the danger passed. Bella survived in hiding. Although Dorel died shortly after the war, the Schanzers remained in close contact with Bonhomme and her descendants. In 1980, the two women were named Righteous Among the Nations at Yad Vashem in Jerusalem. 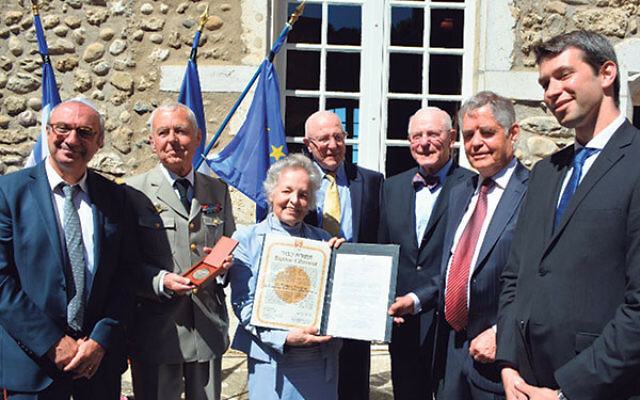 On July 17, in a ceremony on the grounds of Chateau de Virieu, Yad Vashem inducted the count and countess in a ceremony with their three surviving children. After walking from the castle to La Meme’s farmhouse, the brothers, the town’s mayor, and a throng of local residents watched as a sign was unveiled noting that Dorel had sheltered the Schanzer twins during the Shoa. Henry, a member of Congregation Ohr Torah in Edison and his wife, Sheila, have four children, 16 grandchildren, and six great-grandchildren. Bernard, a member of both Ahawas Achim B’nai Jacob & David and Congregation Ohr Torah, both in West Orange, has six children and 25 grandchildren. His first wife, Ellen, died 34 years ago. He is now married to Judy.